Nebraska built a 45-15 lead early in the third quarter and cruised to a 73-52 win over Arkansas Pine Bluff on Saturday at Pinnacle Bank Arena. With the victory, Nebraska improved to 5-3 on the season while Arkansas Pine Bluff, 2-4. Kate Cain, a 6-5 freshman center from Middletown, N.Y., notched her second double-double of the season with 16 points and 11 rebounds while adding three blocked shots. Cain hit 7-of-10 shots from the field for the game. Senior Emily Wood added a career-high 12 points on a career-high four three-pointers while making her third start of the season. The guard from Salina, Kan., added four rebounds, two assists and a career-high three steals in a career-high 29 minutes of action. She drew the start in place of injured freshman Taylor Kissinger who suffered a minor knee injury late in Thursday’s game with Clemson. Kissinger is day-to-day. Cain and Wood were among four Huskers in double figures, including a season-high 13 points from sophomore Nicea Eliely. Junior forward Maddie Simon contributed 10 points and four rebounds in her return to the court after missing the past four games with an ankle injury. As a team, Nebraska hit 41.8 percent (28-67) of its shots from the field, including 30.8 percent (8-26) of its three-pointers. The Huskers also knocked down 9-of-14 free throws. Nebraska also dominated the boards, 50-28, but lost the turnover battle, 17-16. Nebraska built a 37-12 halftime lead by holding Arkansas Pine Bluff to an opponent-record-low four points in the first quarter. The 12 points in the first half also tied a Husker record for the fewest points allowed in the first half. The Lady Lions heated up in the second half though, producing 40 points after halftime. UAPB shot 32.7 percent (17-52) from the field for the game, including 3-for-14 from long range. The Lady Lions went 15-for-21 at the free throw line. Noe’ll Taylor led UAPB with 12 points off the bench, while Faith Ohanta added 10 points and a team-high eight rebounds. Nebraska raced to a 22-4 first-quarter lead on the strength of a 14-0 run early and an 8-0 run to end the quarter. Wood hit back-to-back threes after a traditional three-point play by Cain to give Nebraska a 9-2 lead just three minutes into the game. After another basket by Cain and a three by Eliely, the Huskers took a 14-2 lead with 5:40 left in the quarter and the Lady Lions were never within single digits again. A long jumper by post Shawntayla Harris stopped the run, but Nebraska got a free throw from Janay Morton and back-to-back baskets from Simon and Rachel Blackburn before Grace Mitchell’s three-pointer to end the quarter gave Nebraska a 22-4 edge. The four points allowed by the Huskers in the first quarter were the fewest in a quarter since the change to the quarter system in 2015-16. The Big Red kept throwing down the defense in the second quarter building the lead to 37-8 on a three-pointer by Hannah Whitish with 1:12 left in the half. Whitish finished with nine points, six rebounds, eight assists and three steals. Arkansas Pine Bluff hit four free throws in the final minute of the half, but the Huskers end the half with a 37-12 edge. 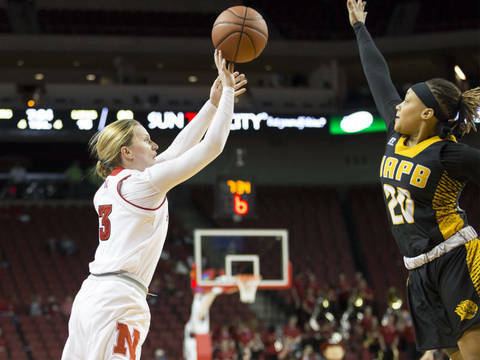 The Huskers held UAPB to just 4-of-20 shooting in the first half including 0-for-6 from three-point range. The Lady Lions did go 4-for-4 at the free throw line. Nebraska went 14-for-33 from the floor and 6-for-16 from three-point range, while knocking down 3-of-5 free throws. Nebraska controlled the glass, 24-12, and won the first-half turnover battle, 11-7. Nebraska returns to road action this week when the Huskers travel to Kansas to take on the Jayhawks Wednesday at 7 p.m.